When it comes to $1 per pack products, Victory is pretty decent. The problem is that Upper Deck has two other $1-$2 per pack hockey card products that smash Victory against the boards when it comes to collectability and value (O-Pee-Chee and Collector's Choice). The good thing is that it's affordable to test drive Victory to see if it's something you like. Just bear in mind this is an extremely generic "cookie-cutter" hockey card product that will inevitably out date itself by the time the hockey season actually begins. Victory's design "is what it is", there's nothing that differentiates it from past years outside of new names and teams on the cards. I've never been a big fan of products that simply plug new names into old card design, unless that design is awesome. With 200 current NHL Stars and 50 NHL Rookies, the checklist is serviceable. The one saving grace of the checklist is that the rookies are short-printed. The inserts are pretty bad, they feature overused and boring themes such as "Game Breakers" and "Stars Of The Game". The true value of this product is it's price point, other than that there aren't many cards in this product that would ever be worth selling on eBay. The only real cards of value are the near impossible to pull 1:1440 pack Black Rookie Parallels. Another problem is that the 2010-11 rookie class isn't nearly as good as the 2009-10 class was; John Tavares rookie card isn't gonna come walking through the door. To the majority of collectors this product isn't collectible. However I do think that kids and budget set builders may enjoy collecting it. 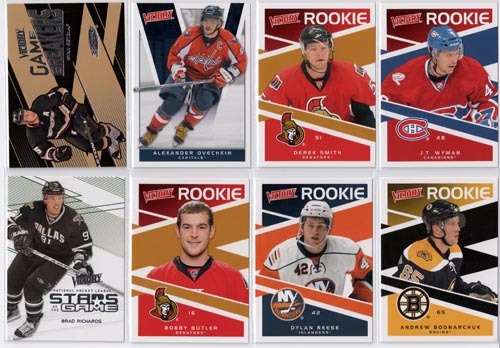 The 250 base set is fairly easy to piece together through opening packs and it has all of hockey's big names which will make Victory tradeable on the playground. I have no problems with a product not containing hits, I just don't enjoy Victory in comparison to the similar priced O-Pee-Chee and Collector's Choice (especially OPC). As I noted above, I do think kids will thoroughly enjoy this product, but to older collectors, Victory just isn't very fun. I always enjoy ripping a box or two of Victory. Its never been the best product out there, but since its the first of the new season, its fun to see players in their new uniforms (for traded) and those kids that debuted late in the season. I have two boxes on the way from Blowout right now…looking forward to ripping into these soon.